There is always scope for improvement, like getting things done faster... In the first year, I wanted to focus on infrastructure and bring it up to speed. Have you met the targets you set for the first year as education minister? There were no targets for one year or two years as such. My aim was to open maximum number of schools, to achieve a satisfactory level of infrastructure, improve facilities and ambience in schools, their size, design and the number of children in each class. We have started work on this. There is always scope for improvement, like getting things done faster… In the first year, I wanted to focus on infrastructure and bring it up to speed. By the end of the year I am satisfied… In the second year I am going to focus on improving training and quality of education. Are the cuts made in the education budget to disburse funds to MCDs following the strike by sanitation workers a major setback? As a finance minister, I had to take a call. 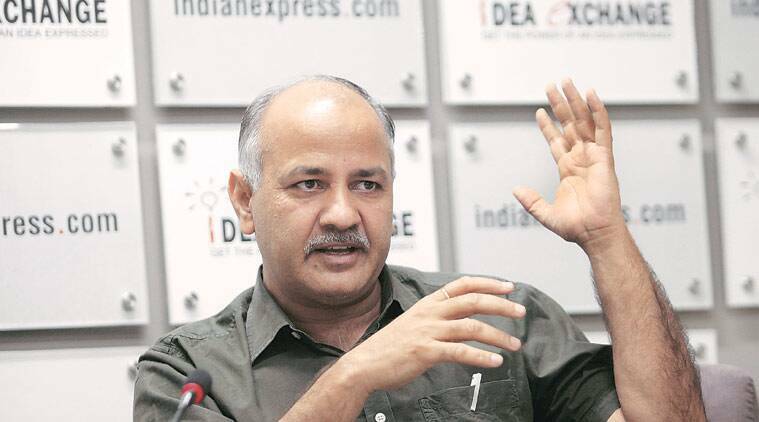 When I was preparing the budget, the education minister won over the finance minister, but this time the finance minister and the urban development minister took over the education minister (all three portfolios are with Sisodia). There was no other avenue to make budget cuts. The consolation was that in the next two months the new budget will be introduced. So the Rs 560 crore that we had to cut from education, will be replenished. So its not a very big setback. How much have you progressed on changing syllabi and imparting value education? I had started with 54 schools as a pilot project and they have seen improvement in terms of ambience. There is nothing called value education but education with value. Value of education is important to me. Learning Gandhiji’s autobiography and knowing where Lord Ram was born does not impart value education. When you become a senior government official and if somebody offers you money to do a job, where does your education go if you take money? At such a time you need to know the value of education. How many of the demands you made to the Union Finance Minister (Arun Jaitley), you think, will actually be met? I have some expectations that I think Mr Jaitley will take care of. Everybody is struggling with pollution. I have requested him to increase excise duty on diesel vehicles not just in Delhi but across the country… I am hopeful that he will also give us a public transport package. I have given him data showing how much municipal funds have been given by the Centre to Punjab, Haryana and Madhya Pradesh. Then why not Delhi? These are the things that he had been very responsive about. He had raised questions about them. I am hopeful that he will do the needful. Projects like Wi-Fi, CCTV and Aam Aadmi Canteen had enthused the public. How far have they moved? There are many financial models for these… we have reached a stage where we are hiring consultants… A project of such a large scale cannot be implemented overnight. What would you call your best moment in the last one year? There was an interesting incident. People always meet me and ask me to get something or the other done. One day I went to a restaurant with my wife and son, and my son said, ‘Papa, people always ask you to do things for them and you say you will do them but do you actually do them or not?’ He is my best judge. Luckily, the waiter came to me and said, ‘Sir, that job in Vinod Nagar has been done.’ That was God’s gift to me. These are the things I remember. What are the lessons you have learnt over the last one year? We have learnt a lot. There are a lot of road blocks in expediting things. Many a times, we don’t feel for the people we work for. We are happy with data. We think so many people are getting pension, but when we check we realise thousands are making fake claims and the money is getting siphoned off… There are corrupt forces that want new experiments to fail. Do you think your government lived up to its claim of weeding out corruption? Not at all. What we achieved was only in the first three months. Then the Centre hijacked the Anti-Corruption Branch… After that they said we have no control on services. They issued a special circular to say we can’t do transfers and postings. This showed the restlessness that honest politics was causing among those with vested interests. Is there a solution in sight for the repeated confrontation with the Centre? There are two things. We are doing our best for education, health, end of licence raj, eliminating 200 types of affidavits, CCTV and Wi-Fi. The other is the state-centre relationship. Why should centre interfere in the day-to-day affairs of a state that has a legislature? We will fight till they let us work in peace. People of Delhi will have to understand where the source of their troubles lies. If someone’s flight is delayed, we cannot be blamed. The job of picking up garbage was given to MCDs that the people elected BJP to run. They have failed to do their job. Has the AAP’s politics also seen a change after a year of governance? It’s evolving. Our targets are clear. They haven’t changed. The means may have changed. Anti-corruption, an educated society with a scientific mind, these remain our targets. Your government took a tough stand against bureaucrats on mass leave a day before odd-even kicked in. How has it affected the government’s relationship with the bureaucracy? In the last one year, that was the most sad and shocking day for me. How could people working with us and responsible for executing governance do this? That too in this unprecedented manner. In the entire country, IAS officers never went on strike. Before this I used to think we are a team and I used to have a sense of belonging. But that day I realised that there is nothing like sense of belonging. It has to be 100 per cent professional. All right then! We will work professionally. No strings attached.